Nitrate deposits in the Arctic remains high even after the turn of the century, despite environmental policies adopted by neighboring countries in the late 20th century to cut nitrogen oxide (NOx) emissions. Joint press release by Hokkaido University, Nagoya University, University of the Ryukyus, Tokyo Institute of Technology, The University of Tokyo, Yamagata University. Aerosols less than 2.5 micrometers are known as particulate matter (PM) 2.5 and are hazardous to human health. Large aerosol particles, on the other hand, help form sun-blocking clouds that cool the Earth’s surface. Concentrations of sulfide oxide (SOx) and NOx which can form aerosols were on the rise from the Industrial Revolution of the mid-18th century to 1980, causing serious air pollution in the 1970s and 1980s. But regulations imposed by the United States, European countries and other developed nations have led to a reduction in SOx and NOx emissions since 1990s. That said, emissions from emerging economies such as China and India have remained high so far. 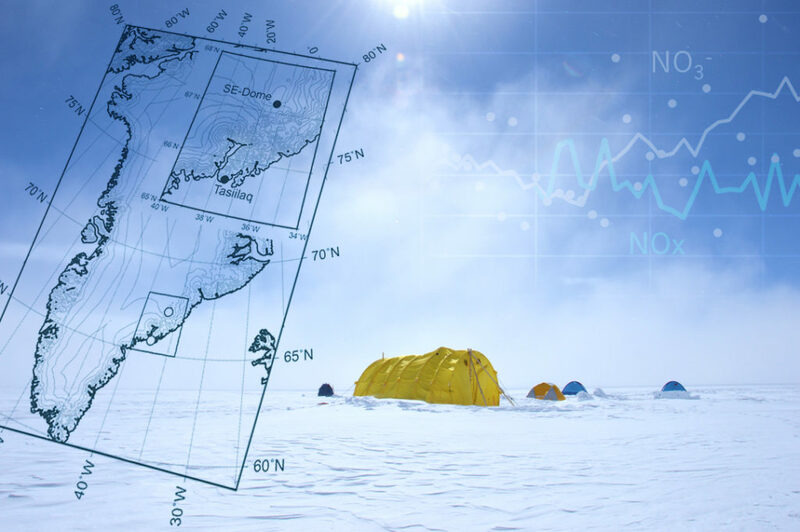 The team including Yoshinori Iizuka of Hokkaido University drilled a 90-meter ice core from the Southeastern Greenland Dome, an ice sheet dome in Greenland that has been used for research on atmospheric aerosol depositions in ice cores from 1957 to 2014. The core sample was kept frozen as it was transported to a cold room at the university’s Institute of Low Temperature Science in 2015. Analysis of the ice core began the following year by melting it to measure the concentration of ions such as sulfate and nitrate. For more information, please visit the website of Hokkaido University.